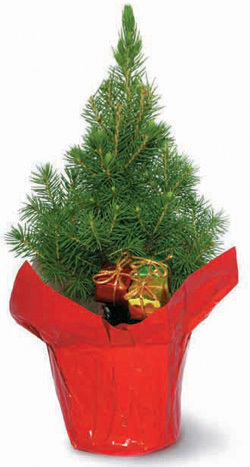 Interested in having a living Christmas Tree? It is hard on a living tree to be brought into the house over the holidays. The dry heat of many houses can be the end of many a living tree. 1} Keep your living tree in a cool part of your house, away from heat sources such as the fire place, heat vents etc. 2} Choose lights for your living tree which do NOT get hot! I have heard this is the #1 reason why living trees do not survive indoors. Christmas lights can generate an amazing amount of heat! Choose lights which remain cool to the touch. 4} Keep the tree well watered, but not sitting in water. 5} Mist the tree every once in a while with a spray bottle to keep the moisture in its branches. 6} When the holidays are over, slowly move the tree outside. The shock of going from a nice cozy house back to the outdoors can be too much! Move the tree from your warm house to a cooler part of the house such as your garage or a covered balcony close to the house and away from drafts and snow. After a two weeks move the tree outdoors. The living tree I have this year is a dwarf Alberta spruce. Please note that if you purchase a Norfolk pine, which are frequently sold in Canada at this time of year, this tips do not apply! Norfolk pines are tropical plants and are a whole other ball game to maintain!